When I arrived in Israel many years ago for an extended first visit, I studied in an ulpan, an intensive Hebrew language school, in Jerusalem. The first vacation we had was for Sukkot. Most of the students went south to the Sinai Desert, which was then in Israeli hands. That was appropriate, because in the Torah the Jews had been in the Sinai during Sukkot. But this was my first visit to Israel and I had not seen the country, so I traveled north to Galilee, and went to Tiberias for the holiday. When I arrived, I set out to look for a synagogue, which I found. Then I searched for a place to stay and, fortunately, found a room to rent for a few days a couple of blocks away. The next morning I went to the synagogue for the morning prayers. Inside, I saw among the men there one unusual-looking person, a man of about sixty, burly, with graying hair, a beard and payot to his shoulders; he had on a gray smock. After services, I asked someone who the rabbi of the synagogue was. I wanted to ask the rabbi to arrange for me to eat in someone's sukkah. But I was told that this synagogue at the time had no rabbi. Oy! What was I to do? I couldn't ask someone else directly, it would be like inviting myself to his house! So, confused, I drifted out to the street, not knowing what to do. Then the burly man in the gray smock came over to me on the sidewalk and asked me, "What do you want?" At that time my Hebrew was rudimentary, but adequate. I said, "I was looking for the rabbi but I found that there is no rabbi here." He said again, more impatiently, "What do you want?" I stammered, because if I told him, it would be inviting myself to his house; but finally, I just had to tell him. "I wanted the rabbi to help me find a sukkah to eat in." "You can be in my sukkah," he said. "But the food is not too good," he said. "O.K.," I said, "I'm not coming for the food." After the services that night, he took me to his home a few blocks away and to his sukkah behind his apartment building. It was a beautiful little sukkah. I remember the colorful fabric covering its walls-- bright red, green, yellow and blue with parrots pictured on it. The walls were lovingly decorated with pictures of the Second Temple, of the great kabbalist, Rabbi Shimon bar Yohai, and so on. There was not that much to eat. But it turned out that this was just the first course. I had thought it was the whole meal! If it was the whole meal, it wasn’t that much food; but as the first of ten courses ... When he had told me the food was not too good, he had been testing me, to see what sort of customer he had. But throughout the whole meal, particularly between courses, my host-- who, I found out, was a Breslover Hasid whose grandfather had come to Israel in the first wave of Hasidim in the 1800's-- was reciting the seder ushpizin -- "The Seder of the Holy Guests"-- from a kabbalistic siddur. According to tradition, a mystic guest visits the sukkah each night of the holiday: The first night, Abraham; the second night Isaac, etc. then Jacob, Moses, Aaron, David, Joseph. My host was also singing many Hasidic niggunim (melodies), some of which I knew and sang along with and others that I picked up. He also danced ecstatically in the sukkah during the meal, and I danced with him. When studying Hasidism, I had often read about a holy meal, but had never truly experienced one until then. The spiritual rule in Judaism is that when you are engaged in a spiritual practice such as davvening or Torah study you avoid interruptions, in order to build up holy energy and deepen your meditation. Conversely, when you engage in a bodily activity that tends to distract you from God-awareness, like eating, you make it a point to interrupt, to break up the bodily energy; and it’s best to interrupt your eating with spiritual activities. So although we ate a gigantic meal of many courses, the physicality of the meal was so often interrupted and infused with spirituality-- recitations, songs, dancing-- that the spiritual “interruptions” joined and formed a “bridge” of spirituality throughout the meal. The spirituality of the meal overwhelmed the physicality and absorbed it. The meal was totally elevated into the spiritual realm. We ate a mountain of food but the experience was totally spiritual. A holy meal indeed. I was in awe of my host who, it was clear, was a great hidden tzaddik-- a person whose holiness is concealed from the eyes of men; after all, here was this holy man and, instead of being famous and surrounded by hundreds of devoted followers, he is eating alone in his sukkah with only one humble guest. Toward the end of the meal I was sitting on a stool with my elbow on the table in the sukkah and resting my head on my hand. I was thinking, "This is a great hidden tzaddik. If I only had the vessels to receive from him, who knows what I could learn from such a person!" Then I thought, "What did I do to merit being with him in his sukkah?" At that very moment, he turned to me and said, "I don't know how I merited to have such a guest in my sukkah!" I almost fell off the stool. Later I realized that in the seder ushpizin the first night's guest is Abraham, and this holy kabbalist was treating me as if I were Abraham-- a great and worthy guest indeed! I have since that time wondered if this tzaddik only wanted one guest-- "Abraham"-- for the first meal in the sukkah. Many years later, about twenty years after the event, I discovered who my host was. I was visiting friends in Boston over Passover and during one meal (not a seder) I was a guest at the home of some friends of my friends, a couple who had returned to Judaism many years ago and became Breslover Hasidim; a wonderful couple, creative and loving. We were sitting at the table and I happened to tell the story about the hidden tzaddik I had met in Tiberias. My host asked me if I remembered his name. I said, "Yes, but only his first name, Rabbi Yisrael." My host continued, "Would you recognize him if you saw him?" "Take that blue book from the shelf near you." Right next to me, within arm's reach, was a small bookcase. I turned around without leaving my seat, took out the blue book, and looked at the picture on the cover. It was my holy host from years ago in the sukkah. He was the late Rabbi Yisrael Ber Odesser, a Breslover Hasid now famous in Israel as an awesome tzaddik. CREDIT: Maggid Yitzhak Buxbaum of Brooklyn, NY directs the Jewish Spirit Maggid Training Program and is the author of ten books, including, The Light and Fire of the Baal Shem Tov, Jewish Spiritual Practices, and Jewish Tales of Holy Women. 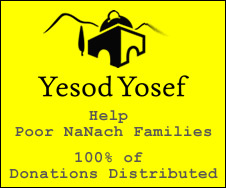 To sign up to receive his free Daily Maggid email of a brief hasidic anecdote or teaching, visit his website at http://www.jewishspirit.com. This is great! Especially because not much is known about what Saba was up to during these years. Thanks for posting!